The Back in Time Zone Tour is a collection of experiences at historic spots in the USA based on vertical time zone regions. This year’s edition is inspired by the 100th birthday of the National Park Service and their #FindYourPark campaign. All month long I’ll be sharing some fantastic places, and hope you’re inspired to see what’s in your part of the country! I know what you’re thinking…The White House is part of the National Park Service? You bet! It’s that kind of surprise that makes the #FindYourPark campaign so awesome, and you never know what’ll make you say”I had no idea!”. Even better to know? Last year Michelle Obama lifted the ban on photos inside 1600 Pennsylvania Avenue and #WhiteHouseTour is so hot right now. Hashtag away my fellow Americans, because this is an awesome place to visit. The White House has SO MUCH history, and it’s only fitting that it’s in my time traveling series. It is part museum, part ceremonial landmark, and has evolved right alongside American story. Though it is the home of the First Family, it nevertheless ultimately belongs to the American People. Tours are self guided and requests must be submitted in advance to your Member of Congress. If you are from outside of the USA, you should contact your embassy in the District of Columbia to inquire about arranging a tour. 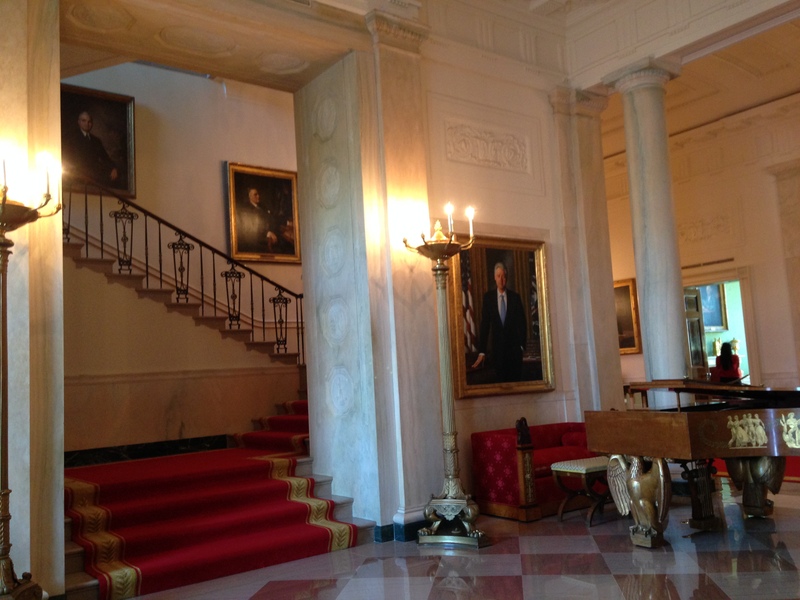 Space is limited, visiting times can be found here, and all White House tours are FREE! Cameras with removable lenses weren’t allowed in, hence my photo quality, but cell phones and simple point and shoot digital cameras were. Common sense should be good with what not to bring, but here’s a list. There’s no storage on site for items so I recommend bringing the absolute bare minimum. That’s me on the right! After much debate of where the young nation’s capitol should be and where its leader should live, President George Washington selected land on the Potomac river that was given by Maryland and Virginia to be the District of Columbia. Government was to operate on land “not exceeding ten miles square”, so careful planning was taken to change what was then farmland into the heart of the USA. City planners mapped out roads and buildings for the district, and construction on the President’s home began in 1792. Irish American architect James Hoban designed the home, and the mansion housed its first President in 1800 when John Adams moved in. In August 1814 it was completely burned down during the War of 1812 by the British but was then rebuilt. The West Wing was added in 1901, followed by the East Wing in 1927. It has undergone countless renovations and construction phases, and each presidency has left a mark of some sort on the home. What’s in a name? Why is it white? You might have learned that it was painted white to hide burns after the British set the mansion on fire during the war of 1812…A nice story, but the legend is very false. As far as historic places go, The White House isn’t stuffed with antiques or gilded up like some of the other historic homes I’ve visited. There are portraits presidents and first ladies everywhere, and it was really cool to recognize them as you walked through. The French inspired Blue Room is where the only wedding of a President and First Lady getting married inside the home has been, and the Green Room was a personal favorite of President Kennedy. The parlors have evolved and been redecorated many times, and the Committee for the Preservation of the White House is dedicated to the mansion’s preservation and function as a museum. The White House Historical Association has a great website with lots of information and photos of the mansion. Give it a look, read up on some history, and #FindYourPark! *Featured image is credited to Wikimedia Commons, and the images in this entry are my own.